I just wanted to pop in to give you this invitation. 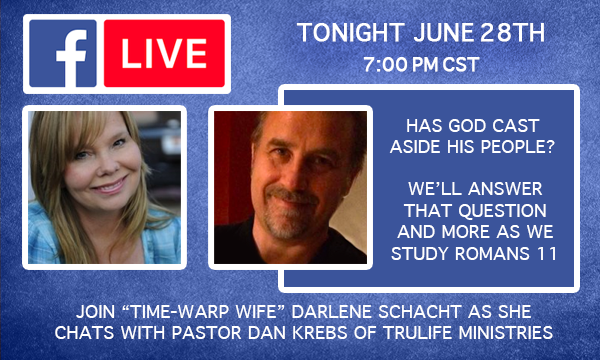 Tonight at 7pm central time I’ll be interviewing Pastor Dan Krebs from Trulife Ministries. Dan is my go-to guy for Jewish history. His father in the faith is a Messianic Jew who has taught Dan so much over the years about their culture and faith. When I thought of Romans chapter 11, I immediately thought of Dan and asked him to be our special guest for my first ever online interview! We’re going sit down in my sunroom, open the Bible to Romans chapter 11, and chat with you live on my facebook page. Here’s the address: @timewarpwife Again the time is 7pm CST. I’ll see you then! I appreciate your ministry so much. FB doesn’t work for me…and I work 2nd shift. I will have to learn to navigate technology to partake in your interactive blessing of a ministry. One more task for my bucket list! You are a precious woman of God and I often keep you in my prayers. I’ll post a replay on my blog Friday. It will remain up on my facebook page. I’ll also post a replay of it here on Friday.